Giorgio Armani dressed select nominees, presenters and attendees of the 25th Annual Screen Actors Guild Awards. The show took place last night, Sunday, January 27th in Los Angeles at the Shrine Auditorium and Expo Hall. Allen Leech wore a Giorgio Armani black two-button notch lapel tuxedo trimmed in satin along with a classic white evening shirt and a bow tie. The jacket features a tonal circular pattern. Leech stars in “Bohemian Rhapsody,” which was nominated for Outstanding Performance by a Cast in a Motion Picture. Leech’s wife, actress Jessica Herman, wore a Giorgio Armani crimson silk sleeveless gown with a front slit. Corey Hawkins wore a Giorgio Armani navy blue two-button shawl collar tuxedo trimmed in grosgrain along with a classic white evening shirt and a bow tie. The jacket features a tone-on-tone leaf pattern. Hawkins stars in “BlacKkKlansman,” which was nominated for Outstanding Performance by a Cast in a Motion Picture. 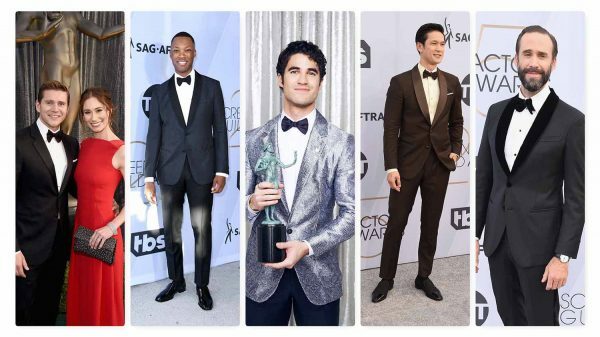 Harry Shum Jr. wore a Giorgio Armani chocolate brown two-button shawl collar tuxedo trimmed in grosgrain. Shum Jr. stars in “Crazy Rich Asians,” which was nominated for Outstanding Performance by a Cast in a Motion Picture. Justin Hartley wore a Giorgio Armani navy blue two-button notch lapel tuxedo trimmed in grosgrain along with a classic navy blue shirt and a velvet bow tie. The jacket features a subtle white diamond pattern. Hartley stars in “This Is Us,” which won the Outstanding Performance by an Ensemble in a Drama Series award. O.T. Fagbenle wore a Giorgio Armani navy blue textured one-button peak lapel tuxedo trimmed in grosgrain along with a classic white evening shirt and a bow tie. Fagbenle stars in “The Handmaid’s Tale,” which was nominated for Outstanding Performance by an Ensemble in a Drama Series. Skylar Gaertner wore an Emporio Armani black one-button shawl collar tuxedo trimmed in satin along with a classic white evening shirt and a bow tie. Gaertner stars in “Ozark,” which was nominated for Outstanding Performance by an Ensemble in a Drama Series. Presenter Ken Jeong wore a Giorgio Armani black velvet double-breasted peak lapel evening jacket trimmed in grosgrain along with classic black evening trousers, a white evening shirt and a bow tie.